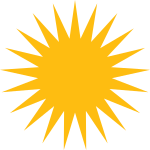 Kurdish literature (in Kurmanji Kurdish language: Wêjeya Kurdî, in Sorani Kurdish language: وێژەی کوردی or ئەدەبی کوردی) is literature written in the Kurdish language. Literary Kurdish works have been written in each of the four main dialects: Zazaki, Gorani, Kurmanji and Sorani. Ali Hariri (1009-1079) is one of the first well-known poets who wrote in Kurdish. He was from the Hakkari region. The Ayyubid Sultanate also saw a Golden Age of Kurdish Literature and was active also outside of Kurdish Mainland. However some Ayyubid Sultans and Emirs also made Arabic Literature or translated them. Some of the earliest texts written in Kurdish are in the Hawrami dialects. The earliest of these are the classical poems attributed to Elder Shalyar the son of Jamasb, an ancient Zoroastrian priest who lived in the Horaman region. His works are said to date back to several centuries before Christ, as far back as 600 BC. His literary works are collected in what is called "marefat". A Yezidi religious work, the Meshefa Reş, is in a classic form of Kurmanji and could well have been written sometime in the 13th century. It is held to have been written by Sheikh Hasan (born 1195 CE), a nephew of Sheikh Adi Ibn Musafir, the prophet of the Yezidis. Based on this date, Meshef can be considered as the oldest piece of prose in Kurmanji. The Kurdish poet Muhammad Faqi Tayran (1590–1660) collected many folk stories in his book In the Words of the Black Horse. He also wrote a book of Sufi verse, The Story of Shaykh of San’ân. Faqi-Tayran also had versified correspondence with the poet Malaye Jaziri. Some of the well-known Kurmanji poets and writers are listed below. Ahmad Khani (1651–1707), the author of Mam and Zin, a long poem of 2,650 distichs, is probably the best known and most popular of the classical Kurdish poets. Ismail Bayazidi (1654–1710), author of a Kurmanji-Arabic-Persian dictionary for children, entitled Guljen. The drama of Mem û Zîn (Mam and Zin) (Memî Alan û Zînî Buhtan), was written in 1694 by Ahmad Khani (1651–1707) from Hakkari, is a rich source of Kurdish culture, history and mythology. This work also emphasizes the national aspirations of the Kurdish people. Mam of the Alan clan and Zin of Buhtan family are two lovers from Alan and Butan families, respectively. Their union is blocked by a person named Bakr of the Bakran clan. Mam eventually dies during a complicated conspiracy by Bakr. When Zin receives the news, she also dies while mourning the death of Mam on his grave. The immense grief leads to her death and she is buried next to Mam. The news of the death of Mam and Zin, spreads quickly among the people of Jazira Butan. Then Bakr's role in the tragedy is revealed, and he takes sanctuary between the two graves. He is eventually captured and slain by the people of Jazira. A thorn bush soon grows out of Bakr’s blood, sending its roots of malice deep into the earth between the lovers’ graves, separating the two even after their death. The first Kurmanji newspaper, titled Kurdistan, was published in Cairo in 1898. The Kurds in the Soviet Union, despite their small numbers, had the opportunity of elementary and university education in Kurdish and for many decades. This in turn led to an appearance of several Kurdish writers and researchers among them. The literary works of Qanate Kurdo and Arab Shamilov are the well known examples of Kurdish prose in the 20th century. The first modern Latin-based alphabet for Kurdish was created by Jaladat Ali Badirkhan, the poet and writer who fled Turkey in the 1920s and spent the rest of his life in Syria. Since the 1970s, there has been a massive effort on the part of Kurds in Turkey to write and to create literary works in Kurdish. The amount of printed material during the last three decades has increased enormously. Many of these activities were centered in Europe particularly Sweden and Germany where many of the immigrant Kurds are living. There are a number of Kurdish publishers in Sweden, partly supported by the Swedish Government. More than two hundred Kurdish titles have appeared in the 1990s. Some of the well known contemporary Kurdish writers from Turkey are Firat Cewerî, Mehmed Uzun, Abdusamet Yigit, Mehmed Emin Bozarslan, Mahmud Baksi, Hesenê Metê, Yekta Uzunoglu (Geylani), Arjen Arî and Rojen Barnas. The main academic center for Kurdish literature and language in Europe is the Kurdish Institute of Paris (Institut Kurde de Paris) founded in 1983. A large number of Kurdish intellectuals and writers from Europe, America and Australia are contributing to the efforts carried out by the Institute for reviving Kurdish language and literature. A manuscript of Ahmadi dictionary by Shex Marof Nodê (1753-1838) from the archive of legacy committee of Vejin. This manuscript is written in 1928. In contrast to Kurmanji, literary works in Sorani appeared only in the late 18th century and early 19th century. Nalî was the first to write poetry in this dialect. and Haji Qadir Koyi of Koy Sanjaq in central Kurdistan (1817–1897), and Sheikh Reza Talabani (1835–1909) also wrote in Sorani dialect after Nalî. The closeness of the two dialects of Sorani and Kurmanji is cited as one of the reasons for the late start in Sorani literature, as well as the fact that during 15th to 19th century, there was a rich literary tradition in the Kurmanji dialect. Despite its late start, Sorani literature progressed with a rapid pace, especially during the early 20th century and after recognition of Sorani as the main language of Kurds in Iraq. The language rights of Kurds were guaranteed by the British and school education in Kurdish started in earnest in the early 1920s. It is estimated that almost 80% of the existing Kurdish literature in the 20th century has been written in Sorani dialect. Increased contact with the Arab world and subsequently western world led to a translation movement among Kurds in Iraqi Kurdistan in the early 20th century. Many classical literary works of Europe were translated into Sorani, including the works of Pushkin, Schiller, Byron and Lamartine. Kurdish is one of the official languages of Iraq and the central government assistance has been instrumental in supporting publication of books and magazines in Kurdish. In the 1970s, an organization called Korî Zaniyarî Kurd (the Kurdish Science Council) was established for academic studies in Kurdish language and literature. It was centered in Baghdad. Kurdish language departments were also opened in some Iraqi universities including Baghdad University, University of Salahaddin and University of Sulaimani. Well-known Sorani poets include Abdulla Goran (founder of the free verse poetry in Kurdish), Sherko Bekas, Abdulla Pashew, Qanih. Many Kurdish writers have written novels, plays and literary analysis including Piramerd, Alaaddin Sajadi, Bakhtyar Ali, Ibrahim Ahmad, Karim Hisami and Hejar. Mishefa Reş, The religious book of the Êzidî (Yezidi) Kurds. (in French) It is held to have been written by Shaykh Hasan (born ca. AD 1195), a nephew of Shaykh Adi ibn Musâfir, the sacred prophet of the Yezidis. Serencam, The book of Yarsan. Mela Hesenê Bateyî (Melayê Bateyî) (1417–1491) of Hekkarî, the author of Mewlûda Kurmancî (Birthday in Kurmanji), a collection of poems. Melayê Cizîrî (Mela Ehmedê Cizîrî) (1570–1640) of Buhtan region, poet and sufi. Faqi Tayran (Feqiyê Teyran) (1590–1660) Student of Melayê Cezîrî. He is credited for contributing the earliest literary account of the Battle of Dimdim in 1609-1610 between Kurds and Safavid Empire. Mehmûd Bayazîdî (Mahmud Bayazidi), (1797–1859 ) Kurdish writer. Piramerd or Pîremêrd (Tewfîq Beg Mehmûd Axa) (1867–1950) Poet, Writer, Playwright and Journalist. Celadet Alî Bedirxan (Jaladat Ali Badirkhan (1893–1951) Writer, Journalist and Linguist. Arab Shamilov (Erebê Şemo) (1897–1978). Kurdish novelist in Armenia. Cigerxwîn or Cegerxwîn(Jigarkhwin) (Sheikmous Hasan) (1903–1984) poet, born in Mardin, Ottoman. Died in Sweden. Abdulla Goran (1904–1962). The founder of modern Kurdish poetry. Osman Sabri (1905–1993) Kurdish poet, writer and journalist, Turkey/Syria. Nado Makhmudov (1907–1990) Kurdish writer and public figure, Armenia. Hemin Mukriyani(Hêmin Mukriyanî)(1920–1986) Poet and Journalist, Iran. Hejar (Abdurrahman Sharafkandi) (1920–1990), Poet, Writer, Translator and Linguist, Iran. Jamal Nebez (1933- ) Writer, Linguist, Translator and Academic, Germany. Sherko Bekas (Şêrko Bêkes) (1940- ) Poet, Iraqi Kurdistan. His poems have been translated to over 10 languages. Latif Halmat (Letîf Helmet) (1947- ) Poet, Iraqi Kurdistan. Sara Omar novelist, Iraqi Kurdistan and Denmark. Abdulla Pashew (Ebdulla Peşêw) (1947- ) Poet. Alan Rubar (1948- ) Poet and translator. Born in Irani Kurdistan, Sardasht. Salim Barakat (1951-) Poet, Writer, and Novelist. Rafiq Sabir (1950- ) Poet, Sweden. Mehmed Uzun (1953–2007), Contemporary Writer and Novelist. Firat Cewerî (1959- ), Contemporary Writer and Novelist. Kovan Sindî (1965-), Poet and Novelist. Jan Dost (1965-), writer and Novelist. İbrahim Halil Baran (1981-), Poet, writer and designer. Ekber Rezaî Kelhor (1966-), Contemporary writer, poet from Kermanshah, Iran. Besam Mistefa (1977-),Contemporary translator, writer and poet from Khamishly, Syria. Suzan Samancı Diyarbakır, Contemporary Writer and Novelist. ^ "The Kurdish Language and Literature". Institutkurde.org. Retrieved 2013-09-02. ^ Kreyenbroek, Philip g. "KURDISH WRITTEN LITERATURE". Encyclopedia Iranica. Retrieved 2009-06-04. ^ Uzunoglu, Yekta (1996). "1985 - bi kurdî binivîsîne Hey lê". Yekta Uzunoglu (in Kurdish). Retrieved 2018-07-07. ^ "Kurdish Institute Of Brussel - Enstituya Kurdî Ya Bruskelê - Instituut Kurde De Bruxelles - Koerdisch Instuut Te Brussel". Kurdishinstitute.be. Archived from the original on October 15, 2012. Retrieved 2013-09-02. This page was last edited on 9 March 2019, at 12:48 (UTC).